What and How do you share Hunts on Social Media? It’s been a long day, and long month since I shared and contribute to SteemHunt. Allow me to share what kind of shares I made to gain hunt tokens and to promote SteemHunt. Recently, SteemHunt Social shares has been a trend from SteemHunt. Not only you get to promote steemhunt in any type of social media platform, but the question is how do you share it and made them click? Ive decided not to count the clicks but instead to also publicize and let the makers or the main creators (if that is how you call it) know and to also share it to them. This type of share not only benefits me, but benefits the three parties. To let the makers/creators know. FYI: I only hunt ocassionally because of what I see in facebook or any type of advertisements. Im not a hard-hunter who hunts everyday and earn Steem. 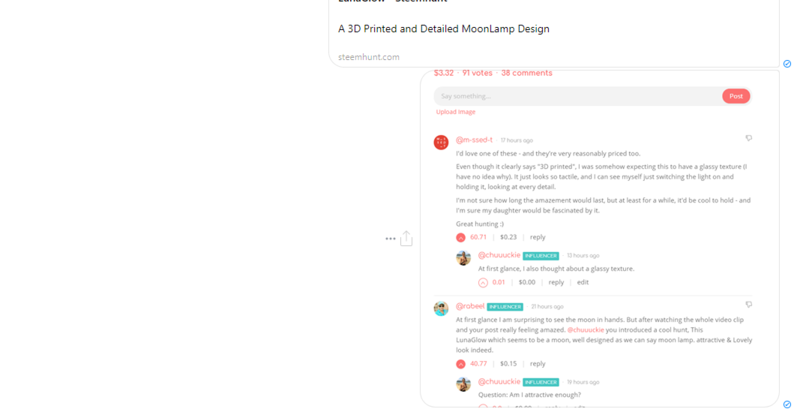 In this section, I just want to share you how good it is to let the creators/makers know that their product/app/game is posted at SteemHunt. So my first attempt was Luna Glow. I dont know if they clicked it or not. But atleast I sent them a private message from their official ad-promotion account. 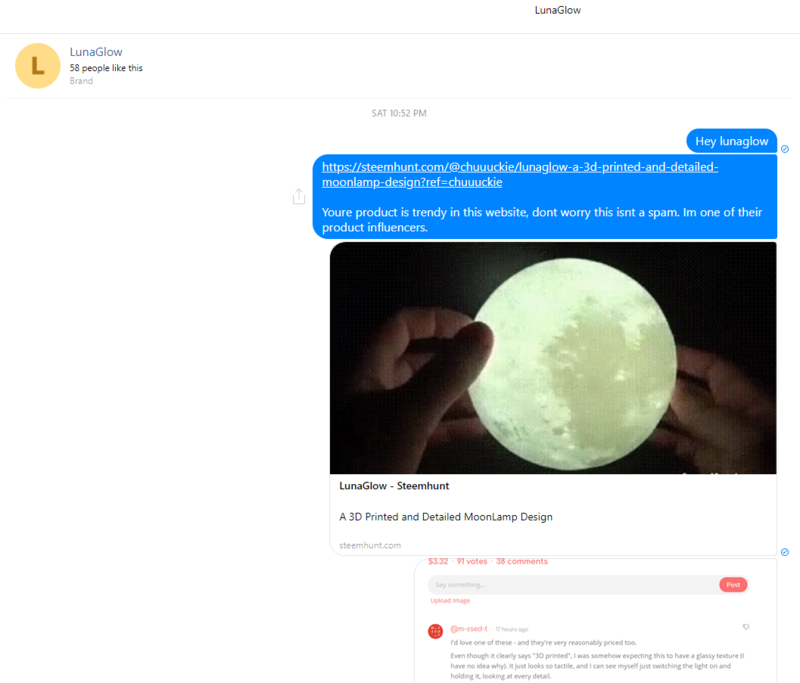 Its funny that I claimed myself to be one of the SteemHunt’s Product influencers. Anyhow, I was expecting for a reply, and I also didnt care from clicks because it is my first Attempt. My 2nd attempt was pretty great. I didnt share it to my friends so I may know that there would be clicks from the Company, and I also could count how many. Luckily they had an amazing reply. Im happy with their reply. Thank you for the awesome support, Isaac! 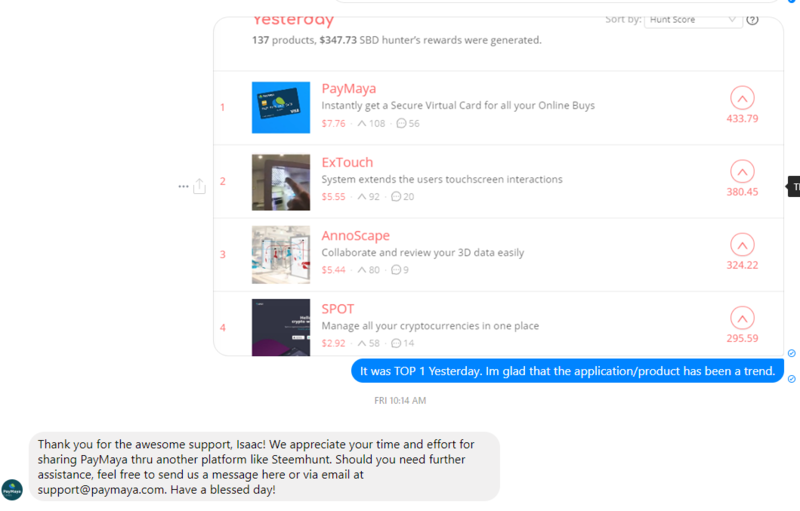 We appreciate your time and effort for sharing PayMaya thru another platform like Steemhunt. 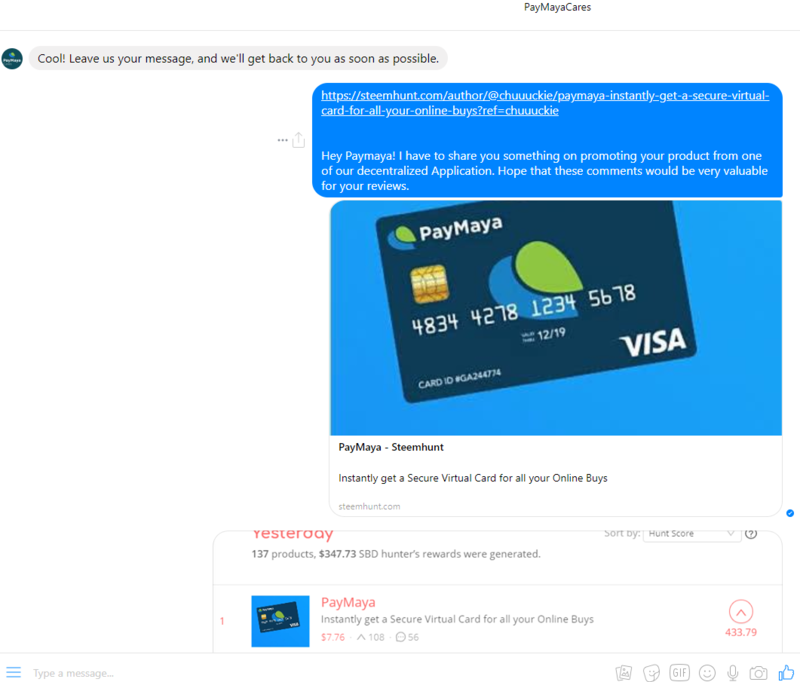 Should you need further assistance, feel free to send us a message here or via email at support@paymaya.com. Have a blessed day!